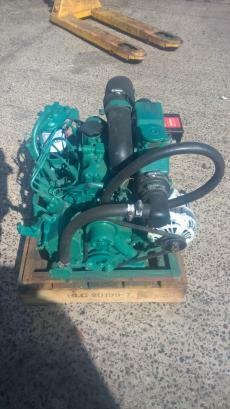 Volvo Penta MD2020 19hp Three Cylinder Heat Exchanger Cooled Marine Diesel Engine Complete With Volvo MS2B Gearbox, Control Panel & Wiring Loom. This engine has undergone a full inspection including removal of cylinder head for valve grinding, removal of pistons and big ends, cylinders re-honed, pistons and shell bearings checked for wear and reassembled with a full new gasket set. It is now palleted having been test run, serviced, cleaned and repainted and is now ready for delivery to a new home. 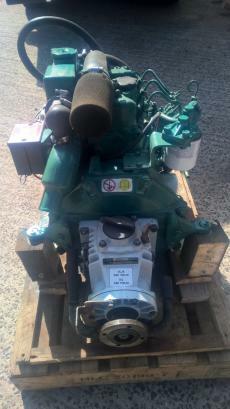 Price is £1749 for a bobtail engine with instrumentation or £2,195 supplied with a Volvo MS2B-L Gearbox as pictured.